BJP won big in Uttar Pradesh and Uttarakhand assembly elections. The extent of its victory was not expected by pollsters or even by BJP itself. In these two states BJP won 381 of the 473 seats, or over 80% of the total. Punjab wasn’t all good news for BJP. The party and its ally SAD lost in Punjab. BJP also failed to reach a majority in Goa and Manipur, although it did manage to form governments in both states. However, the win in UP alone was far bigger than losses in smaller states. After all, when it comes to 2019 Lok Sabha elections, gargantuan UP has 80 Lok Sabha seats, nearly five times the number of seats of Punjab (13), Goa (2) and Manipur (2) put together. Hence, no matter how much Rahul Gandhi acolytes try to sweeten the bitter news to him by claiming Congress didn’t do so badly, the fact is simple: BJP did spectacularly well. The current victory sets the stage for a huge BJP advantage in 2019. It cements Prime Minister Narendra Modi’s image as an effective leader. In 2014 Modi represented change, something voters craved. In 2017, Modi’s victory means they are happy with the change they made. In that sense, the 2017 victory is a bigger deal for Modi than even 2014. In 2014, Modi came in with so many expectations that he was bound to disappoint. However, that didn’t happen. His popularity, at least in the states that matter for Lok Sabha elections, stays intact. People like his workaholic nature, the constant attempt to announce radical schemes, his vision and his attempts to restore Indian pride in the eyes of the world. Demonetization, even though of questionable benefit economically, was a failure. BJP, meanwhile, continues to commit the biggest mistake one can make in politics – not listen to people. Rahul Gandhi has started inspiring India’s youth. As their tallest leader, he is a big positive. In that sense Amarinder Singh’s victory in Punjab is even more remarkable. 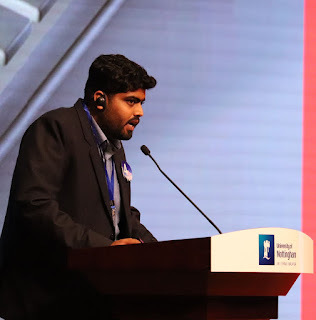 Regional parties, which came into being when national parties ignored a particular state, seem to be losing some relevance, at least in a few places. BJP and Modi seem to be heavily focused on UP, and rightly so. It is not just a state government at stake; it is a ticket to Lok Sabha elections. With the national parties themselves doing what people of UP need, it becomes difficult for the likes of SP or BSP to justify their existence, apart from shallow identity politics. And frankly, the number of votes that kind of crude identity politics can pull in is just not enough. Even AAP is having a bit of an existential crisis. Formed on an anti-corruption plank, but still AAP is finding it easy to pull in voters for itself with no big scams haunting the current government. 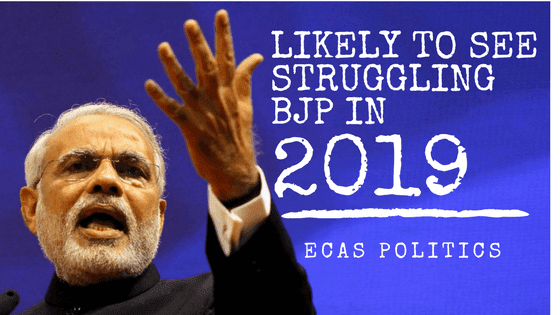 Hence, with a diconnected Modi, a growing Congress and regional parties becoming irrelevant in key Lok Sabha states, Modi’s victory in 2019 is a doubt. Of course, we still have two more years to go until elections. However, given the pace of reform in Congress and the growth of new ideas from regional parties, it doesn’t look like we have got a winner. In fact, Modi is likely to become stronger. With the current lost in Bye-Elections of Gurdaspur, Modi government will have to struggle hard for the Lok Sabha. The government can enact several legislations that can help it win 2019. There are some risks. The best example is the Bihar assembly election which happened a year ago. In a jungle, sometimes all the hyenas get together to ambush the lion, and even manage to win occasionally. A mahagathbandhan or an opportunists’ alliance can come together, comprising of almost all other major parties, in a bid to defeat Modi. It would probably be bad for India if such an alliance wins. Each little party will enjoy the fruits of power to put it mildly, and there would be no one accountable. And yet, such an alliance can win. The SP plus vote share in UP was 22%, and so was that of BSP. BJP had 40%. If BSP and SP had combined in a Bihar-style hyena move, they could have fared better. Of course, egos of people involved make this far more difficult in practice than the arithmetic on paper. The second risk for the Modi government is a self-goal. When you take initiative and float new ideas, the risk of one of them going wrong is higher. Doing nothing means you commit less mistakes, but that is what the Modi government is all about. Demonetisation didn't work, also GST scheme may not. Hence, the Modi government will have to evaluate the political risks of any new policy thoroughly beforehand. 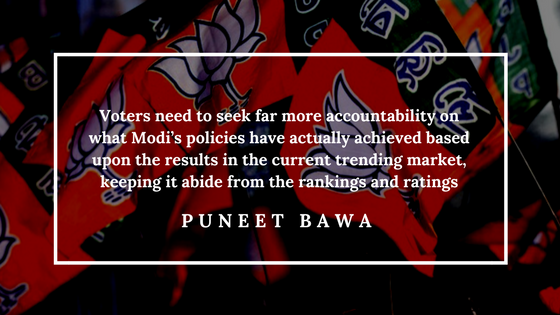 At some point, voters may also seek far more accountability on what Modi’s policies have actually achieved. However, that stage is more likely to be a 2019 issue rather than 2024 issues.